The University of Oregon continues to clean up from the recent snow and ice storm and campus trees are still vulnerable to further damage. Several areas have debris piles or tree limb hazards and should be avoided. Click here for a map of these locations. As members of the greater community, the UO is sharing information from the City of Eugene regarding its efforts (details below) and an updated weather forecast for tonight. As communicated by the City of Eugene, the National Weather Service has issued a wind advisory for tonight starting at 10 p.m. Use caution around trees damaged by Saturday’s ice storm. Stay well clear of trees that may leaning or that have loose hanging limbs. Public Works is continuing to clear trees and limbs from streets and sidewalks. Crews have cleared a number of locations on major thoroughfares, but wiring tangled in some trees has limited crews’ ability to respond to some locations for safety reasons. Operations has split the city into seventeen sectors in which crews are focused primarily on clearing any blockages. Efforts will transition to cleaning up the debris left by damaged trees. In addition, Public Works had assessment teams out in the field reporting and prioritizing hazards. Plowing efforts have been successful clearing priority routes. Streets that had been blocked will be plowed as needed today. The plowing equipment will transition to debris hauling equipment to support the tree crews. Stormwater operations are continuing to keep catch basins and curb inlets open for the melting snow. Localized flooding from melted snow and ice has not been an issue thanks to the mitigation efforts of Public Works staff. The potential of flooding will remain as weather forecasts predicted rainfall for the next several days. Many sidewalks are covered with slush or even snow and ice in higher elevations. Property owners are reminded that they are responsible for keeping sidewalks passable next to their homes or businesses and bear the liability if someone slips or falls on a poorly maintained sidewalk. The National Weather Service has issued a wind advisory for tonight starting at 10 pm. Use caution around trees damaged by Saturday’s ice storm. Say well clear of trees that may leaning or that have loose hanging limbs. To report a blocked street, hazardous trees or street flooding in Eugene, call 541-682-4800. For power outages in Eugene, call EWEB at 541-484-2300. Public Works cannot respond to trees on private property. Property owners are advised to contact commercial tree services for assistance in dealing with trees on private property. For updates on Public Works storm operations, go to www.eugene-or.gov/snow. Airport travelers are advised to check flight schedules. Up-to-date flight information is at www.flyEUG.com. For information about the status of other City services, go to www.eugene-or.gov. AT&T Mobility is undertaking a major upgrade of their cell site at Hayward Field this month. This facility/tower serves much of the campus area. Starting today (2/11) or tomorrow (2/12), they will be bringing the site completely down to install new equipment and antennas that will double its capacity. Their crew will be working 12 hour days at the Hayward site for the next few weeks and expect to have it back on line by March 1st. During this time, it’s possible AT&T customers on campus may experience some degradation in service given the central location of this tower. Service degradation could include reduced ability to make/receive phone calls or ability to use cellular data in locations on campus currently covered. If you need help or support with a UO managed cellphone device or plan handled through UO NTS, please contact at NTS@ithelp.uoregon.edu or by phone at 541-346-NETS (6-6387). As campus continues to recover from the snow and ice storm, everyone’s cooperation to maintain safety on campus is appreciated. Several areas still have debris piles or tree limb hazards. Please avoid the areas as indicated on this map. Campus Operations crews and arborists have been working around the clock to remove the debris and address safety hazards. In addition to debris clean-up, arborists are evaluating unseen vulnerabilities that can continue to be dangerous after the snow and ice melt. Please do not remove caution tape around the debris and tree hazard areas. UOAlert! : Monday, Feb. 10, 2014, 9 a.m.
As students, faculty and staff arrive on campus, they will find dozens of downed tree limbs and approximately 60 university employees working to remove the debris and address safety hazards. In addition to debris clean-up, arborists are evaluating unseen vulnerabilities that can continue to be dangerous after the snow and ice melt. 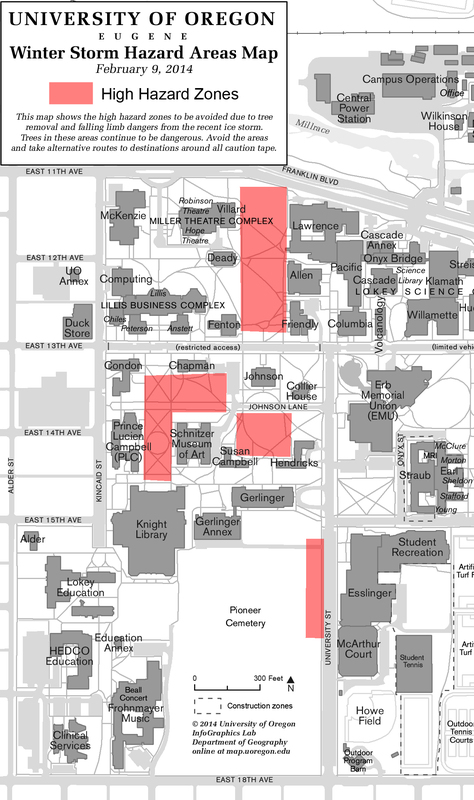 Please DO NOT REMOVE caution tape and AVOID the areas blocked off as indicated on this map. Campus Operations crews have been working long hours around the clock during the storm and everyone’s cooperation to maintain safety is appreciated. As melting occurs, please walk carefully and avoid walking next to buildings that may have falling snow and ice from the roof. UOAlert! : Sunday, Feb. 9, 2014, 4 p.m. Snow and ice have impacted approximately 100 trees on the University of Oregon campus. Falling tree limbs can be very dangerous and unseen vulnerabilities must be evaluated by experienced arborists. Currently, crews are using caution tape in areas that are of the highest concern. Please DO NOT REMOVE caution tape and AVOID the areas blocked off. As melting occurs, please also avoid walking next to buildings that may have falling snow and ice from the roof. UO Alert! : Sunday, Feb, 9, 2014, 9:30 a.m.
Winter weather continues to make for dangerous conditions on campus and throughout the Eugene Springfield area. Please use extreme caution when outdoors and there are several downed trees and power lines in the greater campus community. Avoid walking under or near trees or downed power lines. There are dozens of downed tree limbs on campus due to icy conditions, and Campus Operations continues to work to improve the areas impacted most. As heavy snow and ice begin to melt, there is increased risk from roof slides; therefore, avoid walking immediately adjacent to buildings. • – Ice can increase the weight of branches by 30 times. • – A 1/2″ accumulation on power lines can add 500 pounds of extra weight. Visit http://webcam.uoregon.edu for a view of current conditions. UOAlert! : Saturday, Feb. 8, 2014, 7 p.m. The University of Oregon has canceled classes and events for Sunday morning, Feb. 9. While campus is typically less active on weekends, it is home for 4,000 students and employees are responsible for supporting a world class research enterprise. – EMU – 10 a.m. to 11 p.m.
– Student Recreation Center – 10 a.m. to 12 a.m.
For students and others on campus, please use extreme caution and avoid walking under or near trees as there are dozens of downed tree limbs due to icy conditions. The UO’s Eugene campus remains operational and employees are expected to report to regular duties to support campus activities beyond canceled classes and events. Extremely dangerous conditions continue on campus and throughout the Eugene community due to ice accumulation on trees and power lines. Avoid outdoor travel if possible. If traveling is necessary, please use extreme caution and avoid walking under or near trees. – Ice can increase the weight of branches by 30 times. – A 1/2″ accumulation on power lines can add 500 pounds of extra weight. UOAlert! : Saturday, Feb. 8, 2014, 3:00 p.m.
– EMU – 11:30 a.m. to 8 p.m.
– EMU Craft Center – 11:30 a.m. to 5 p.m. The Oregon women’s basketball game against Utah, rescheduled for 2 p.m. on Saturday, Feb. 8 at Matthew Knight Arena, will be free and is being offered for those within walking distance, especially students. Stay off the roads if possible. More cars and people out in severe conditions raises the chances of accidents. If you can, keep yourself safer by staying inside. The risk of falling ice will increase as temperatures rise and ice begins to melt. With freezing rain continuing to accumulate on trees and buildings, there is an increased hazard from falling ice and broken branches. Try to avoid walking under trees, and next to buildings. Wear appropriate clothes. It’s cold and wet. Exposed skin can become frostbitten or lead to other medical problems. Cover up and wear shoes that can take the snow and keep some traction. Even wearing a pair of heavy socks over your shoes can help provide extra traction. Water-resistant outerwear is advised to prevent chilling. UOAlert! : Friday, Feb. 7, 2014, 7 p.m. The University of Oregon has canceled classes and events for Saturday morning, Feb. 8. While campus is typically less active on weekends, it is home for 4,000 students and employees are responsible for supporting a world class research enterprise. The UO’s Eugene campus remains operational and employees are expected to report to regular duties to support campus activities beyond canceled classes and events. For more information about how the university evaluates weather-related decision, read http://around.uoregon.edu/content/weather-decisions-qa-uos-emergency-management-chief.